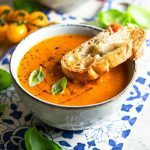 A rich and creamy Roasted Tomato Soup made with fresh cherry tomatoes, caramelised shallots, fresh thyme and basil. This soup is super easy to make and is both comforting and healthy. Serve with slices crusty bread. Pre-heat the oven to 200C (400F). Wash and dry fresh, ripe cherry tomatoes (any colour, I like a mix) and take them off the vine if still attached. Add them to a baking tray with 4 large cloves of garlic (crushed with the back of a knife but skins still on), thyme, salt, pepper and olive oil. Roast them in the oven until the garlic is soft and the tomatoes are soft and juicy (around 30 minutes). Meanwhile, add butter and oil to a saucepan and saute the shallots on a low heat until soft and deep brown, do not rush this part it will take around 15-20 minutes. Once the tomatoes are roasted remove the garlic skins and discard then add the roasted tomatoes and garlic with any juice to the onions. Add vegetable stock then bring to a boil. Turn off the heat and blitz the soup until completely smooth using an immersion blender (handheld) alternatively carefully ladle it into a blender making sure not to overfill it. Finally add some freshly chopped basil before serving. Top Tip: The soup will be smooth but the seeds from the tomatoes will remain. If you'd rather have a completely silky smooth soup them pass it through a sieve before serving to remove any seeds. Try topping with homemade pesto, it's delicious!